No post on ethics today, things are a little busy this week. But I'll resume the regular weekly posting schedule next week. That's all. I got my driver's license photo updated today. I think that if I was writing a book about the current era, I'd title it, "Don't Smile." Note: This post is the fifty-seventh in a series. 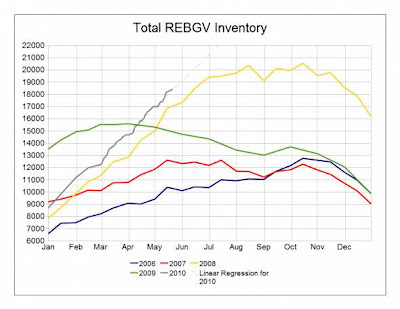 Click here for the full listing of the series. The first post in the series has more detail on the book 'Systems of Survival' by Jane Jacobs. As you might have guess by the title, this week's post concerns the book, 'The Prince' by Niccolo Machiavelli. Written in 1513, it consists of advice to those who would be Prince (leader) of a territory. "I say at once there are fewer difficulties in holding hereditary states, and those long accustomed to the family of their prince, than new ones; for it is sufficient only not to transgress the customs of his ancestors, and to deal prudently with circumstances as they arise, for a prince of average powers to maintain himself in his state, unless he be deprived of it by some extraordinary and excessive force; and if he should be so deprived of it, whenever anything sinister happens to the usurper, he will regain it." "...it ought to be remembered that there is nothing more difficult to take in hand, more perilous to conduct, or more uncertain in its success, than to take the lead in the introduction of a new order of things, because the innovator has for enemies all those who have done well under the old conditions, and lukewarm defenders in those who may do well under the new. This coolness arises partly from fear of the opponents, who have the laws on their side, and partly from the incredulity of men, who do not readily believe in new things until they have had a long experience of them. Thus it happens that whenever those who are hostile have the opportunity to attack they do it like partisans, whilst the others defend lukewarmly, in such wise that the prince is endangered along with them." "...if one holds his state based on these arms, he will stand neither firm nor safe; for they are disunited, ambitious, and without discipline, unfaithful, valiant before friends, cowardly before enemies; they have neither the fear of God nor fidelity to men, and destruction is deferred only so long as the attack is; for in peace one is robbed by them, and in war by the enemy. The fact is, they have no other attraction or reason for keeping the field than a trifle of stipend, which is not sufficient to make them willing to die for you. They are ready enough to be your soldiers whilst you do not make war, but if war comes they take themselves off or run from the foe; which I should have little trouble to prove, for the ruin of Italy has been caused by nothing else than by resting all her hopes for many years on mercenaries"
"Yet it cannot be called talent to slay fellow-citizens, to deceive friends, to be without faith, without mercy, without religion; such methods may gain empire, but not glory. Still, if the courage of Agathocles in entering into and extricating himself from dangers be considered, together with his greatness of mind in enduring and overcoming hardships, it cannot be seen why he should be esteemed less than the most notable captain. Nevertheless, his barbarous cruelty and inhumanity with infinite wickedness do not permit him to be celebrated among the most excellent men." "It is not essential, then, that a Prince should have all the good qualities which I have enumerated above, but it is most essential that he should seem to have them; I will even venture to affirm that if he has and invariably practices them all, they are hurtful, whereas the appearance of having them is useful. Thus , it is well to seem merciful, faithful, humane, religious and upright, and also to be so; but the mind should remain so balanced that were it needful not to be so, you should be able and know how to change to the contrary. And you are to understand that a Prince, and most of all a new Prince, cannot observe all those rules of conduct in respect whereof men are accounted good, being often forced, in order to preserve his Princedom, to act in opposition to good faith, charity, humanity, and religion." Machiavelli believes that this course will work out because, "...if a Prince succeeds in establishing and maintaining his authority, the means will always be judged honourable and be approved by everyone." "a prince ought to inspire fear in such a way that, if he does not win love, he avoids hatred; because he can endure very well being feared whilst he is not hated, which will always be as long as he abstains from the property of his citizens and subjects and from their women. But when it is necessary for him to proceed against the life of someone, he must do it on proper justification and for manifest cause, but above all things he must keep his hands off the property of others, because men more quickly forget the death of their father than the loss of their patrimony." Furthermore, Machiavelli states that, "a Prince is despised when he is seen to be fickle, frivolous, effeminate, pusillanimous, or irresolute." Generally, Machiavelli's recommendations hew quite well to the Guardian syndrome. He opposes the use of mercenaries which violates the precept of 'shun trading', he acknowledges the value of respect for tradition in Guardian work, he approves of 'deceit for the task' and commends those Princes who 'exert prowess' and those soldiers who are loyal, obedient and respect hierarchy. The one point of disagreement between Machiavelli and the guardian syndrome is that whereas the Guardian syndrome contains the precept, 'dispense largesse', Machiavelli cautions against doing this to excess as it will only lead to the financial ruin of the Princedom, suggesting that a reputation as a miser is something a Prince must put up with in order to be able to run military campaigns without overburdening the populace. what happens in 2014 - they need some help from the referee just to get a late consolation goal against Fiji? Meanwhile, the way things are going, they should rename the tournament, the America's cup based on the way teams from the Americas have been sailing through the first round. I guess it won't last but so far North and South America are unbeaten against the rest of the world (Mexico one win and one tie, U.S. two ties, Chile beat Honduras, Brazil is 1-0, Argentina is 2-0, Uruguay and Paraguay both have a win and a tie). Note: This post is the fifty-sixth in a series. Click here for the full listing of the series. The first post in the series has more detail on the book 'Systems of Survival' by Jane Jacobs. I was driving across the prairies a couple of weeks ago (long story) and I noticed the sign on the Manitoba border claimed that Manitoba was the 'keystone' province, and it got me thinking. "The term [keystone] is used figuratively to refer to the central supporting element of a larger structure, such as a theory or an organization, without which the whole structure would collapse,"
"the architectural piece at the crown of a vault or arch which marks its apex, locking the other pieces into position." "The happiness and prosperity of mankind, arising from the social virtue of benevolence and its subdivisions, may be compared to a wall, built by many hands, which still rises by each stone that is heaped upon it, and receives increase proportional to the diligence and care of each workman. The same happiness, raised by the social virtue of justice and its subdivisions, may be compared to the building of a vault, where each individual stone would, of itself, fall to the ground; nor is the whole fabric supported but by the mutual assistance and combination of its corresponding parts." Imagine a prisoner's dilemma type situation with more than two participants. For the sake of example, let's say 10 people. But the cooperative benefit is only gained if all 10 people cooperate. If even just one person defects, then the whole effort of everyone else is wasted. You could imagine a game where 10 people choose to put money in to a collective pot and if everyone contributes, the money is doubled, but any person is able to choose to take what the others have contributed instead of contributing themselves. Are there situations like this in real life? Well, in a military battle, only a single traitor can have a disastrous impact on his/her erstwhile allies. That may be one reason why treason is considered the most serious of crimes. Or consider another type of prisoner's dilemma. In this one, the cooperative benefit is proportional to how many people cooperate. So if, say 7 out of 10 people cooperate, than there will some benefit, but not as much as if all 10 did. But now imagine that this dilemma is repeated over and over, and that people can see what the others are doing. After the first instance where the 3 defectors take advantage of the 7 cooperators, it seems likely that some of the 7 will cease to cooperate. As the number of cooperators drops, the number of people taking advantage of the remaining cooperators grows larger, and the pressure grows for everyone to defect. In 'The Efficient Society' Joseph Heath gave the example of littering as a situation where if there is no litter, then people feel embarrassed to litter themselves, but if they are surrounded by litter dropped by other people, the situation reverses and they feel embarrassed to be the sucker carrying their litter to the garbage instead of just dropping it. These sorts of situations resemble a hand on a clock face that can have one of two equilibriums. One with the hand pointing upwards towards 12 which is unstable because any perturbing of the hand (i.e. defection from the people in the dilemma) will cause the hand to fall toward the other equilibrium with the hand pointing towards the 6. The equilibrium at 6 is stable because, even if you give the hand a little push, it will return to the 6 due to gravity. Similarly, even if a few people try to start a move towards cooperation in the group prisoner's dilemma, unless they can get everyone involved, the effort is likely to fail. "This understanding of the fundamental power of the communal spirit leads to a meaningful explanation of coercion in the state economy. Coercion is a means of assuring the full effectiveness of the communal spirit, which is not equally developed in all members of the community. Coercion forces the individual to act as if he were inspired by communal spirit. Coercion is only the outer clasp and fastening of the community, but if communal spirit be lacking, coercion can replace it only in part." 2) In a multi-participant dilemma, full cooperation and monopoly behaviour are equivalent descriptions. This is different than simple economies of scale where a larger effort is more productive (per amount of effort) than a smaller effort. This is not a case of natural monopoly as much as it is a case of necessary or efficient monopoly. "National Bank of Canada worries that the impact of rising interest rates on the residential housing sector “could be dire” in Canada. 'Though the Bank of Canada has done well to set its rate normalization process in motion, the fact remains that the stakes at play are high, with home prices and household debt at record levels relative to income,'"
"Finance Minister Jim Flaherty says a solution to Europe's debt problem will be the top issue for the G20 summit in Toronto this month." New Copyright Bill (C-32) Introduced into Parliament, But Will the American (Corporation)s be Satisfied? The past few years have seen a number of attempts by the party in power (first the Liberals, now the Conservatives) to introduce a copyright bill in Canada that copies the American legislation. In the debate there have generally been two sides. On the one hand, the Canadian public which supports a bill that won't make millions of Canadians into criminals just for acting like they own the things that they have bought. On the other hand, there are large American media corporations that want to squeeze as much profit as possible from their movies, recordings, etc. Traditionally, the interests of the Canadian public (commoners) have been represented by Members of Parliament, who sit in the House of Commons, and legislation has been introduced in the House of Commons in recognition of this fact. But in the case of this bill, the government decided that rather than introduce it in the House of Commons, they would introduce it in the House of Large Foreign Corporations, specifically the offices of a large American media company. Just in case you missed that bit of symbolism of whose interests the bill (and the government) represents, Michael Geist refers us to a quote from the chief of staff for Maxime Bernier (from 2007 when Bernier was Industry Minister) saying that Harper's office told the ministers responsible for copyright that, "We don't care what you do, as long as the U.S. is satisfied." 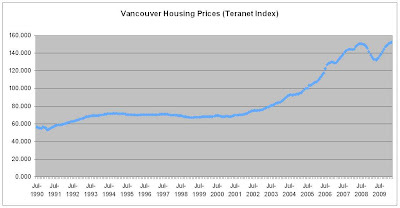 Labels: AmericaNorth, conservative party worse than useless, copyright, u.s.
And the last one to know"
So, a while back in 2007, I predicted that Vancouver housing prices would peak in 2008 - and they did, as the graph below shows (click to enlarge). But somewhat implicit in my prediction was the notion that they wouldn't reach a higher peak in 2010, which they also did. 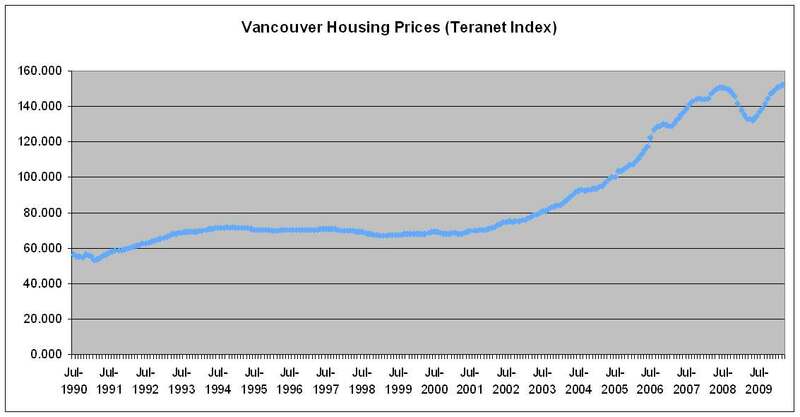 Note: Chart was originally posted by commenter vibe in the forum at Vancouver Condo Info. 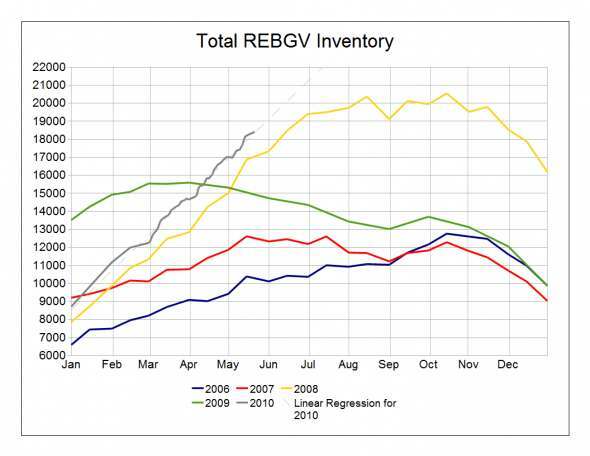 REBGV = Real Estate Board of Greater Vancouver. "Unfortunately the working class still can't find the pinata." From 'Beezer', commenting on a post over at Mark Thoma's about why Washington doesn't seem to be too concerned about very high unemployment rates. Note: This post is the fifty-fifth in a series. Click here for the full listing of the series. The first post in the series has more detail on the book 'Systems of Survival' by Jane Jacobs. In a world where everyone is the same and they all just pursue their own self-interest with no regard for what happens to other people, the question of what happens when people with different preference types interact doesn't arise. But my last post raised the possibility that people might have different 'temperaments' with respect to how they personally are affected by the fate of the people they deal with. As Alan anticipated in the comments on the last post, if there are different sorts of people potentially out there, then a natural question is to try and see what happens if the different types interact with one another and how a collection of different types of people might change over time. One of the best known ways that a population makeup can change over time is via evolutionary dynamics. People who are more 'successful' with their actions will have more children than those who are less successful, meaning that, over time, more successful strategies will come to dominate. A common debate in the social sciences is then whether unselfish behaviour can sustain itself over time, given that selfish people might be able to take advantage of the unselfishness of the altruists. It's true that a group of unselfish people will likely outperform a group of selfish people, but then won't the unselfish group fall victim to selfishness from within? The answers are (as usual) it depends, but I won't get into the details any more in this particular post (with a 2 hour episode of wipeout on tonight, time for posting is limited!). Evolutionary dynamics are not the only way for a population makeup to change over time. Imitation works too. The Czech Republic (for example) isn't a capitalist country because it was outbred by capitalist countries, it's capitalist (arguably, at least) because the population decided to imitate what they felt was a more successful method of doing things. At a personal level, people will imitate what they other people doing around them if they feel those people are successful (see also Bubble, Housing). A third option is migration. If people are able to move from one society to another, their movements will alter the distribution of preference types within each society. A constant migration of unselfish types to an unselfish society might offset a trend towards successful acts of selfishness within that society, for example. A fourth mechanism is that the people themselves do not change, but their relative strength of influence does. Maybe an unselfish society contains only one selfish person, but if that person uses their unchecked greed as a means to taking control of the whole society, then the society could change dramatically despite nobody changing their particular nature. No doubt there are other mechanisms by which the makeup of preferences in a society can change over time - I can't think of any at the moment, but feel free to point them out in the comments. This is all pretty abstract, but the point is that it would theoretically be possible to model or simulate various ways in which a society of people with different preference types might evolve over time, applying different mechanisms by which behaviours might spread or change or change in influence over time. There are folks out there who have undertaken this sort of work, and I'll cover some of their efforts in future posts.